Back of the Cereal Box: How Does the Fox Make You Feel? 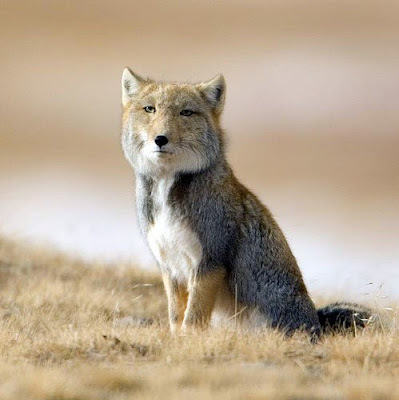 The image and the post were brought to my attention by someone who says this Tibetan fox has a people face — as in, it kind of looks like someone took a human and then Photoshopped his face onto the body of this animal to make a grotesque vulpine-human hybrid. I have to agree, though I couldn’t explain why: This animal does have a strange facial quality that gives him human-like characteristics. As a result of or maybe in spite of this, the animal also looks funny for reasons I can’t put my finger on. And that’s weird, because things that exhibit human-like characteristics make me uncomfortable more often than not. Does he look nervous? Imperious? A little sad? A little uncomfortable himself? Would appreciate any comments on this fox’s accidental or deliberate human mimicry as well as on how you perceive his mental state. So perhaps the fox is simply concerned with the state of modern journalism. Good call. Especially with that particular photo. I guess you could say the fox looks nebishy. It looks a lot like an robot fox that should be bearing a hat and singing an educational song. I think it's sort of the look John Houseman gave idiotic 1L's in "Paper Chase." The fox has an odd expression that somehow fails to settle into a definitive mien. Maybe it's the asymmetry: one half (the sunny side) is sad or neutral, and the other half (shadow side) is more sinister, or more probably I've just fallen into the trap of inferring more than is there. The weird feelings might be attributable to the uncanny valley. Good points, all around. You all responded well to this. I guess I should post more pictures of eerily human-like animals. this looks scary a little.. and still it's funny!